All the way back in the third episode of Silicon Valley, I made the observation that a central lesson to take from the show was the message “Look before you leap.” Multiple seasons later, that message hasn’t become any less relevant. Putting the “neg” in “negotiations,” spilling evidence of a conspiracy onto the floor, messing with a rival’s laptop during a tech convention caper: the Pied Piper team continues to make decisions without fully considering the relevant details or consequences. And even when they try to look ahead, they fall victim to a different sort of myopia, such as Richard’s desire to avoid previous overspending by consigning his team to a borderline black site. And in “Chief Operating Officer,” it’s clear that their days of making bad decisions aren’t in the past just yet. However, it also proves that they’ve gotten smarter about how they handle those decisions, no as easily bullied or swayed and more willing to listen to their better judgments. It’s another encouraging sign that Silicon Valley is forging a more assured path in its new environment, and further strengthening its position with one of the most genuine moments in its cynical life. 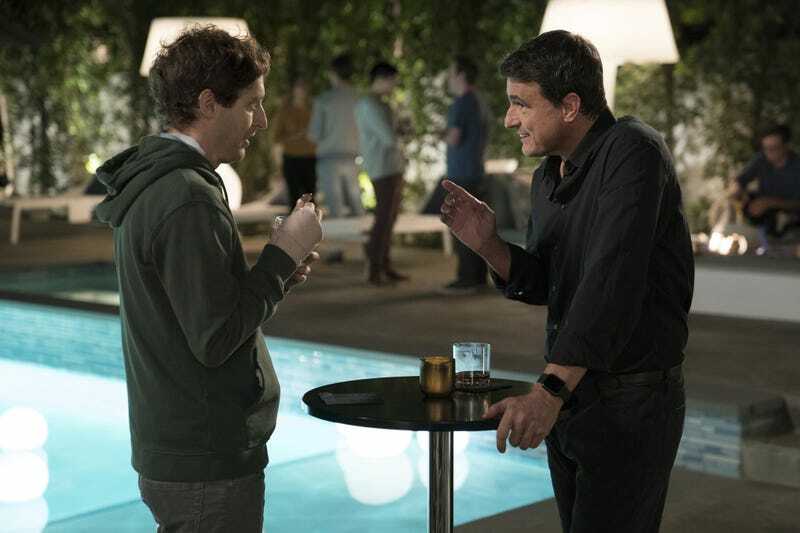 Instead, he gravitates toward COO Ben Burkhardt, who’s both more outgoing and also genuinely interested in Richard’s concept of a new Internet. As played by Ben Koldkye (who has appeared on many shows but will always be Work It star Ben Koldyke to me), Ben is shrewd and likable, projecting the exact confidence that appeals to the terminally unconfident Richard. Practicing a “radical candor,” he strikes the happy medium for Richard between the Laurie Bream and Russ Hanneman extremes of the industry, and manages to come across as someone he could be friends with. Their connection also makes sense in the context of the company’s changing fortune, as Pied Piper’s rapidly becoming a more professional operation that more experienced operatives would want to work for. And Richard could use the help, as once again Pied Piper’s facing the threat of lawsuit. “Stallion” programmer and Hooli mole Jeff Washburn (Armen Weitzman) adds “Dinesh’s roommate” to his list of titles this week, a reluctant offer that becomes a lot less reluctant when he learns how talkative a drunk Dinesh can be. A “normal amount” of vodka later, Dinesh stops bitching about Gilfoyle enough to spill the beans that the smart fridges were the backup system that saved Pied Piper from disaster in the fourth season finale. It didn’t make for a particularly compelling close to that season, but writer Carrie Kemper finds some new mileage by adding it to the list of semi-legal/outright illegal things that the company has had to do to keep itself alive. The blame for this event falls on Gilfoyle, and couldn’t happen to him at a worse time. As the company’s becoming more legitimate, Gilfoyle’s iconoclastic behavior is only growing more pronounced: showing up to work an hour after any scheduled staff meetings, and blaring a harsh song by the band Napalm Death so he can toggle his rig any time the price of bitcoin fluctuates. (Which is a lot. It’s a volatile industry.) Five seasons in it’s remarkable that the original Pied Piper team has stayed together this long, given Jared is the only one who displays anything approximating loyalty or even empathy for the rest of the team. Ben pitches to Richard that cutting off Gilfoyle would isolate Pied Piper from the legal troubles, and it’s clear that Gilfoyle’s given Richard few reasons not to. There is one reason though, and it’s the reason that’s helped keep Pied Piper afloat all these years: Gilfoyle is good at what he does. As the saga of Anton and other related instances have taught us, the only thing that even comes close to drawing emotion from Gilfoyle is the idea that something’s not right with his codes. It turns into a splinter in his mind, driving him Jian-Yang’s house to dissect the smart fridge and start chain-smoking as he’s increasingly unable to find the source of the leak. (Poor Dinesh, unable to see him frantic in that moment and unaware he’s the accidental cause of this.) While not a full break from monotone, it’s nice Martin Starr can break out of the mold when called upon. And in doing his job, it reminds us that Jared is equally good at his job. Patiently listening to Gilfoyle’s conspiracy rants, he’s able to pull out the detail that Seppen has an even bigger legal problem than Pied Piper does at the moment. Silicon Valley’s finding itself more topically relevant in these days of data breaches and privacy concerns, first with Richard’s societal goals for his new Internet and now with the reveal that the smart fridges are potentially recording everything their users say. Faster than you can say “I have a Seppen bread maker and I’ve never been happier with an appliance,” he’s negotiated an end to the lawsuit, secured Pied Piper some more work, and learned that Gavin Belson was the puppet master in this legal affair—all of which he discloses while Richard dumbly nods. 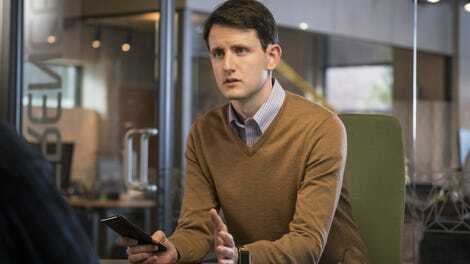 Silicon Valley writers take a deep pleasure in beating up Jared, and it’s fun to watch because the character is so unflaggingly earnest and Zach Woods is so game to let his character’s inner life become darker and darker. This week however, he was right about everything: the strength of the respective Seppen cases, Dana being a fairly cool guy when he’s not getting over a head cold, and Ben’s history of “unprofessional departures” from previous companies. Richard finally gets to see that with clear eyes, and makes the right choice. He points out to Ben that no offer for COO was made, shows him the door, and then makes the offer to the most deserving candidate. It’s a rare win for Jared, a shockingly sincere moment in this wholly cynical show, and a sign that the team is going to be able to circle the wagons and maintain a united front against this new threat. That is until Dinesh runs up to Jeff and excitedly lets him know that there’s a mole in the company. They may be getting smarter, but these guys don’t always make the best decisions. Speaking of, Jian-Yang’s incubator “administration” is mostly devoted to pitching new versions of existing programs for Chinese markets. Ideas included New Reddit, New Grubhub, New Spotify, New Kickstarter, and (a hastily erased) New Pied Piper. I’m willing to bet that Jared got at least four women’s phone numbers while he was at Dana’s party. This guy fucks. Kudos to the writers for not forcing Dinesh and Gilfoyle to become roommates as soon as they left the house. It’ll probably get to that point—this is the one true love story of the series after all—but to do so this early would have been lazy writing. This week’s closing track: “Cop Drama,” Clearslide.